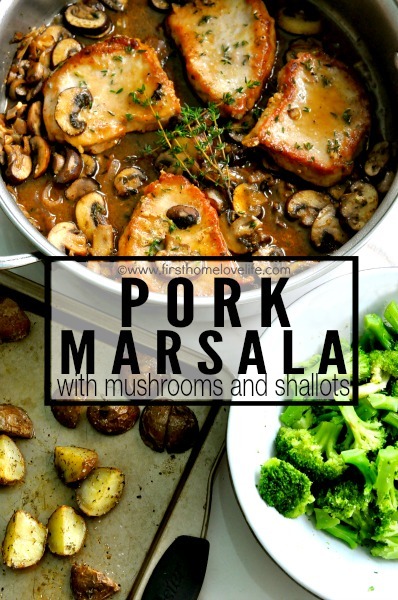 Pork Marsala with Mushrooms and Shallots- a crazy simple yet scrumptiously great dinner, served in 30 minutes or less! Here I’m serving it up with roasted potatoes and broccoli, but I’ve served it with egg noodles and green beans before and it’s just as good! I love that its super versatile in that way, because its fun to switch up the routine dinners to keep you from getting bored, ya know? On a plate or shallow bowl add flour, garlic powder and salt and pepper-mix. Toss your pork in the mixture to coat all sides and tap off the excess. In a saute pan or similar add butter and oil to a medium high heat, when butter is melted, add pork. Add pork to pan and cook, flipping over one time when sides get golden brown. 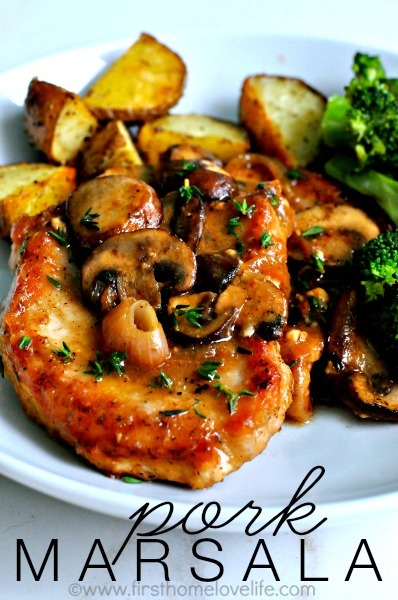 Lower the heat to medium-lowish and add your mushrooms, shallots, and garlic to the pan. Use tongs to toss them around so they are touching the pan. It will be ready when the sauce has thickened into a gravy. Could it be any simpler? You know…We’re coming up on entertaining season, and this could easily be served to a crowd. Your friends and family will think you’re amazing – I won’t tell them how easy it was to make, promise! ?